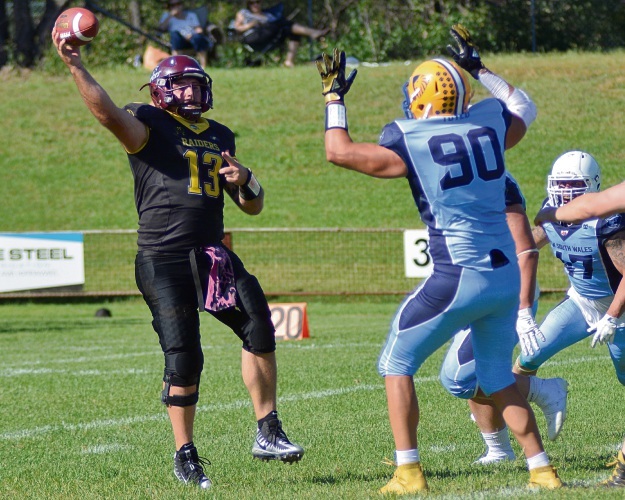 WA Raiders head coach Lane Honda expects a difficult game against Victoria in the team’s second game of the Australian Gridiron League. The Raiders pulled off a late 15-13 win against New South Wales in Wollongong on April 14 and will take on the Victorians at Curtin University at 2pm on Saturday, April 28. Honda said the team was confident it could beat New South Wales but he felt they did not play well. “The penalties killed us and put us in bad field positions,” he said. “It was good to come from behind and claim the win, we kicked a field goal with 1 minute and 30 seconds left on the clock. Honda said he expected Victoria to run the ball against the Raiders. “They are a very physically strong team but I think we have the best quarterback and receivers but we need to run the ball better,” he said. The Raiders will play South Australia away and Queensland at home in upcoming fixtures.